Manipulative field studies are useful for investigating cause杄ffect relationships between contamination and benthic community health. 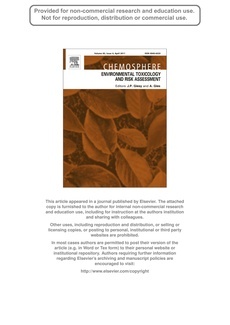 However, there are many challenges for creating environmentally relevant exposures and determining what measurements are necessary to correctly interpret the results. This study describes the physical and chemical changes in the properties of metal-spiked marine sediments deployed in four different locations for up to 11 months. The test sediments lost between 20% and 75% of their volume during the deployment period, with the greatest losses occurring at sites affected by strong hydrodynamic activity. More sediment was lost from clean treatments than those spiked with high metal concentrations and corresponded with differential recruitment of infauna to these treatments. In general, a greater proportion of spiked-metals remained at lower energy sites (48�%) than at higher energy sites (15�%). The decreased metal concentrations were attributed mostly to the loss of the metal-spiked sediments (through resuspension) and their dilution with sediments depositing from the surrounding environment. A range of recommendations are made for optimising the information gained from field-based studies using metal-spiked sediments. These include the careful documentation of physico- chemical sediment properties pre- and post-deployment, the use of co-located sediment traps and knowledge of site-specific hydrodynamic processes.